The cool refreshing crunch of broccoli and carrots enrobed in a creamy sauce for a delightful summer dish. I love the bounty of fresh fruits and vegetables in summertime. The flood of colors, textures, and flavors are a welcome break from the same old winter squash and potatoes of cooler months. Though available year-round at your local supermarket, during the summer months, broccoli's often served in a raw vegetable platter with ranch dip or hummus. Well, we recently found some dirt cheap (no pun intended) broccoli at the local grocery. I've roasted my fair share of broccoli, but I was always left with the dilemma of what to do with the broccoli stalks. (Plus, it's a hot summer!) I've roasted them along with the florets or found some other way to transform them into a tolerable and edible form before. And that's as far as I'd gotten - tolerable. Until I saw some broccoli slaw mixes. Then I thought about all the broccoli stalks I had at home. Broccoli slaw? Could such a thing be delicious? Surprisingly it was, and it made for a cool and enjoyable dish worthy of the summer heat! 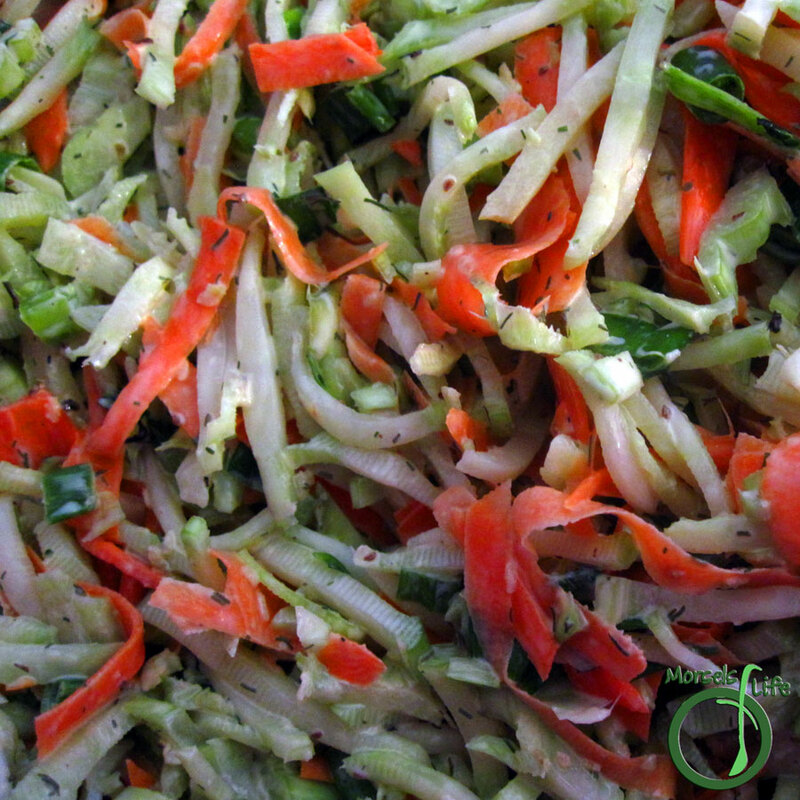 :) I made a whole heaping load of this broccoli slaw with about 6-8 broccoli stalks, so this broccoli slaw not only reduces waste, it also goes a long way! What do you do with leftover food parts? 2 cups carrots, thinly julienned I just used a vegetable peeler and then cut into smaller pieces. Combine all materials except green onions and broccoli, and mix until uniform. Add mixture to broccoli, then add in green onions.